Welcome to Kent Island Beach House LLC on the Eastern shore of MD. All four of our modern short-term rental homes are located in Queen Anne’s County on Kent Island in the town of Stevensville MD just minutes from Kent Narrows, Chester, Queenstown, Annapolis, and Easton. We officially opened our KI Beach House for business in April 2011, our KI Golf House in August 2013, our KI Beach House II January 2015, and our KI Beach House III by the Bay in April 2019. We are very excited and confident that you will enjoy your stay in both the area and more importantly in one of our unique vacation homes. These homes are perfect for the Bride or Groom's guests and/or your family and friends not to mention that they are business travel ready for your co-workers small reunion or retreat. 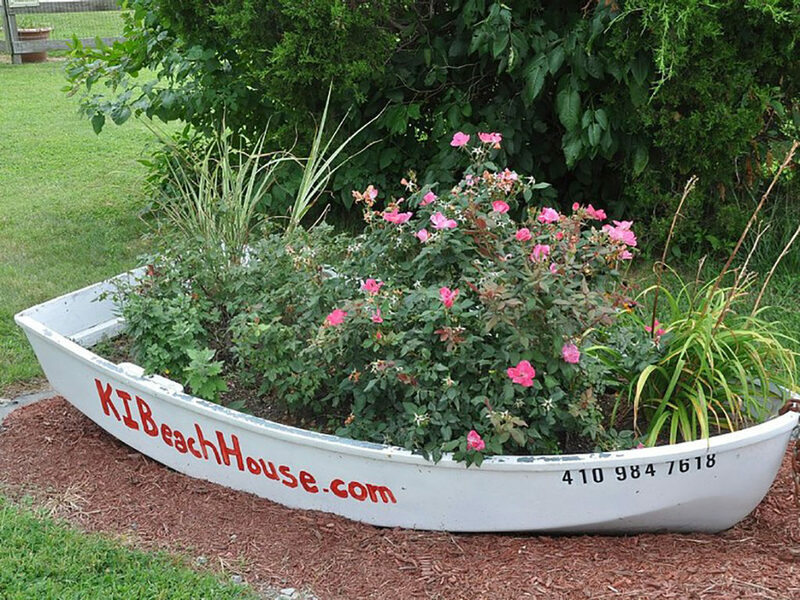 The water view KI Beach House (sleeps 12) and KI Beach House II (sleeps 12) side-by-side locations overlook the Chesapeake Bay across from the waterfront Kentmorr Restaurant, Beach, Marina, and Dirty Dave's Tiki Bar. KI Golf House: A Par for the Course (sleeps 10) overlooks the Blue Heron Golf Course and our latest Kent Island Beach House III by the Bay (sleeps 8 all in king beds) in the Sunny Isle of Kent is an awesome location to enjoy unobstructed bay views and unbelievable sunsets. You counted right; we can sleep up to 42 people total in four homes all within a couple miles of one another. 20 minutes to Annapolis, 30 minutes to Baltimore, 40 minutes to Easton, 45 minutes to DC, 50 minutes to St. Michaels, 2 hrs to Ocean City, and just around the corner from all the wedding hotspots. We take great pride in sharing our home(s) with you and know that our customers are the heart of our business. It is utmost important to us that you are satisfied during your stay and we always encourage our guests to let us know what we can do better to earn return business. Follow us on Facebook and read our reviews on vrbo.com/351587 and other locations to see for yourself. 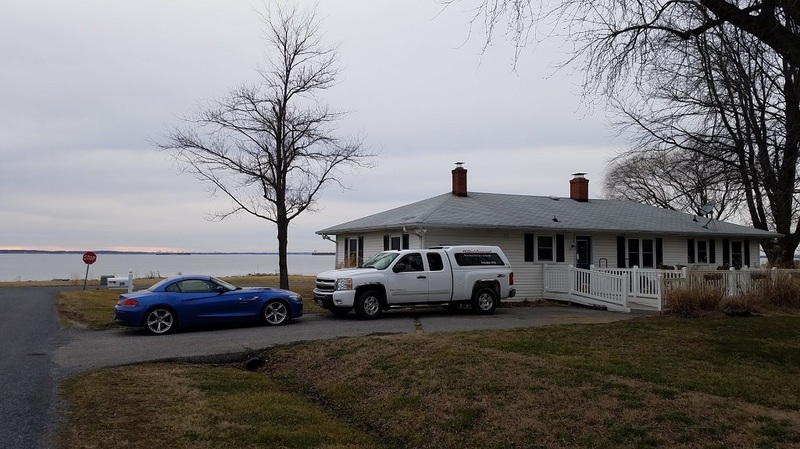 Our Beachy House by the Bay in the heart of the Sunny Isle of Kent is now available for rent offering astounding waterfront unobstructed views of the Chesapeake Bay including a front and back attached deck. An awesome kitchen, dining, and living area for the foodies in the bunch along with 4 King Bedrooms and 2 baths to sleep 8. Gaze at the famous Bay Bridge that separates Kent Island from the mainland and Annapolis. This is the perfect place to relax, recharge, and experience panoramic sunsets along the Eastern Shore. Like our other locations, this newly acquired home provides comfortable scenic lodging for bridal accommodations and/or a corporate, family, couples, guys, or gals retreat. Seas the Day with this Stay. Call or email Donna today! 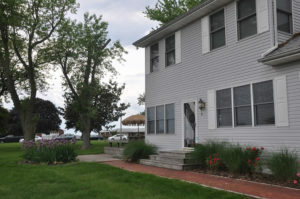 Our waterview KI Beach House location sleeps 10-12 comfortably. This 1800 sq ft very spacious tastefully decorated 4 bedroom/3 bath home with an attached deck off of the open kitchen living area overlooks a private beach volleyball court and the Chesapeake Bay. Walk over to Kentmorr Restaurant and Dirty Dave's Tiki Bar where you can swim at the beach or just sit on our deck and grill and chill! The beachy Master Suite includes a large King Bedroom that steps down to a his and hers sink, custom tile shower, and jetted whirlpool tub. Across the hall is the Palm Bath, linen closet, and Queen Bedroom. Paddle down the hall to the 3rd Bedroom with a Queen Bed plus a Twin over Double Bunk. A huge private family room with big screen TVs and a large fireplace make a 4th bedroom with a daybed w/trundle (2 twin beds) in addition to a full sofa bed, sofa, and loveseat. The 3rd Pink Bathroom with a shower adjoins this room for your comfort and privacy. Although not ADA handicap accessible, the ramp at the deck and the back door by the garage make this home wheelchair/walker accessible. Our KI Golf House sleeps 10 comfortably. This 2-Story 1800 sq ft 4 bedroom 2 1/2 bath naughty torquoise beachy golfy home offers plenty of room for entertaining inside and out. The owners, Kent Island residents themselves, are the property managers and this one is a real PAR for the course right across from the public Blue Heron Golf Course and only a mile to the beach and other Kent Island Beach Houses. Relish nearby Golf, Fishing, Beaches, Bars/Restaurants, Shopping/Consignment Shops/Outlets, Wedding Hotspots, Art, Wineries, Breweries and more. Enjoy plenty of comfortable seating in the living/dining room along with a large private yard; something just not available with the "hotel blocks". The King Master Suite is downstairs in addition to another Queen Bedroom including a bath and a half. Upstairs a full bath and hall separates 2 bedrooms. Each of those bedrooms contains a double plus twin bunk above and beside to maximize the beds for sleeping arrangements. Total beds: 1 King, 1 Queen, 2 Double, 2 Twin, and 2 Bunks. 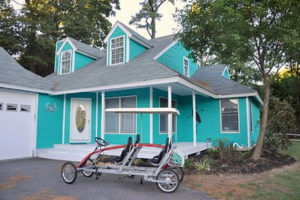 Stay 3 nights or more in season and enjoy our surrey and/or bikes on the Kent Island Trail. Our waterview KI Beach House II sleeps 10-12 comfortably. 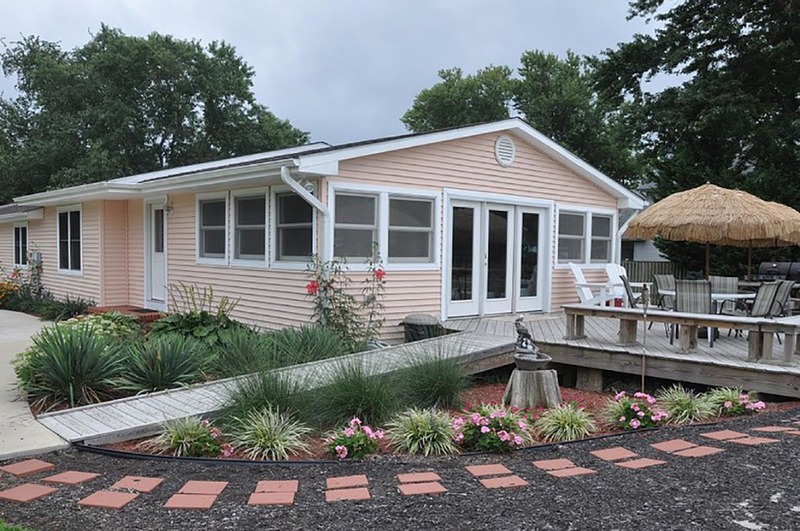 This 2000 sq ft 4 bedroom/2 bath home is a modern fisherman's village on the corner by the marina and conveniently side-by-side with our original KI Beach House. Not only a great place to stay to visit the Naval Academy, attend a destination wedding or event, but our homes are perfect for a small company strategy session, retreat, or a central location to see what MD, DC, VA, DE, and PA have to offer. Walk in from the oversized deck to enjoy open entertaining including big flat screen Internet TVs. Picturesque Panoramic Water Views await you. See the fishing boats go out in the morning or wait for them to head back into port to clean the catch of the day. There are 2 bedrooms downstairs with a Queen in one and 2 Queens in the other in addition to a full futon in the living room. Head upstairs to the nautical Captain's Quarters with a King bed, sofa, and chair for sleeping separated from the mate's Queen bedroom by an awesome red anchor's away soaking tub and tiled shower bathroom for your peace and relaxation. Kent Island Beach Houses: Location! BAYcation! STAYcation!